Art certainly has the power to change lives; however most of us who purchase a sculpture or painting don't quit our day job and break out the paints or clay. Clearly, Utah sculptor Scott Rogers isn't "most of us." Rogers had always been interested sculpture, and when he finally made his first purchase: a bronze sculpted by his uncle, Grant Speed, he fell in love. He spent days and then months looking at and enjoying it until he said, "I can do that." He immediately went to the nearest art supply store and cleaned them out of clay. "It's something I wish everyone in the world could experience," Rogers shared. "I had this gnawing, this prompting, that said 'I can do that.' Within 15 minutes I had purchased every bit of clay and started sculpting that night." Rogers, who had been selling oil and gas wells with his father in Texas, is a strong believer in listening to those inner-promptings that he believes happen to all of us. "I just think most people never act on them. How much do we all miss out on because we don't act on those promptings?" For Rogers, following his instincts has proven extremely fruitful. After a year of sculpting on his own, without any formal instruction, Rogers met the man who would become his mentor. "I was at a foundry, and there was a sculptor. I didn't particularly like his work. It wasn't the cleanest--spiritually or artistically--but his words spoke to me. He said I should take a sculpting workshop, and it was another one of those prick-in-the-heart things. Something in me said, 'I'm gonna do that.'" Rogers was accepted into a workshop in Kerrville, Texas, and it was an experience that changed his life. "As the sculptor sat and taught I felt like my DNA was changing," Rogers confessed. "I was seeing like I'd never seen before--like an artist. The piece I sculpted in those five days was placed in a gallery and it sold the next day. I sold the whole line (30 pieces), made $90,000, and thought there must be something there." That fated workshop was presented by Fritz White, his dear friend and mentor. "His wife told me, 'He's been waiting 30 years for you to come along.' I am so fortunate to be trained by the best in the world; maybe there's some natural talent but I was taught how to use composition, balance and design. I trust I'll find that person for me to teach and mentor." One of the most prominent things Rogers learned is to incorporate different geometric shapes into his sculptures. His works might have ovals or figure eights repeated throughout, though they won't be obvious to the casual observer. The shapes are used to evoke specific feelings. Rogers explains, "If I sat and drew the letter 's' repeatedly, it gives me a certain feeling. If I draw lightning bolts, that gives a different feeling. With sculpture it might be the silhouette that gives off the feeling--is it smooth or jagged? It's interesting to study that humanity has specific responses to certain shapes. Think about looking at an old coke bottle or a Christmas ornament, those shapes give you a certain feeling." 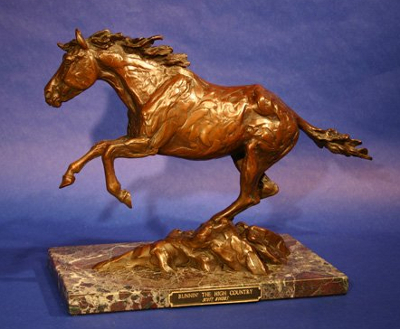 Rogers' creations can be found in galleries in Santa Fe, Dallas and Scottsdale. His works tell very human stories about the Old West. People seem to resonate with his sculptures due to the strong emotions that they provoke. "I latch on to a single emotion for each piece," he explains. "It's like living a lifetime in one piece, and I exhaust that one emotion. Everything supports that. If you look at my work, you won't see two or three emotions represented. I think it's one thing that sets my work apart." Another thing that stands out about Rogers' sculptures is the sense of rhythm, motion and life--he specializes in grouped figures and his depictions of a courtroom, a funeral, or even a lynch mob put the viewer in the scene, feeling the emotions of the people portrayed. "I love multi-figured pieces with beautiful synchronicity, where one person flows into the next," he said, describing his favorite type of pieces to sculpt. Rogers strives to tell stories, evoke emotions, and bare a bit of his own soul through his works. A tour of his website features his pieces, many accompanied by stories he writes to help the admirer better understand the art. 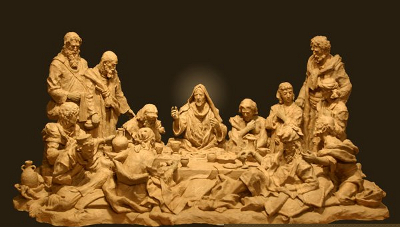 Rogers recently finished "The Last Supper" after thinking about it, researching it and working on it in one way or another for years. "It has been an incredible journey of creation," Rogers writes on his website. "It's the only thing I touched for a single year." "I love sculpting," Rogers enthuses. "There's a newness to life when I'm sculpting. I can live on that razor's edge of the newness of life over and over."